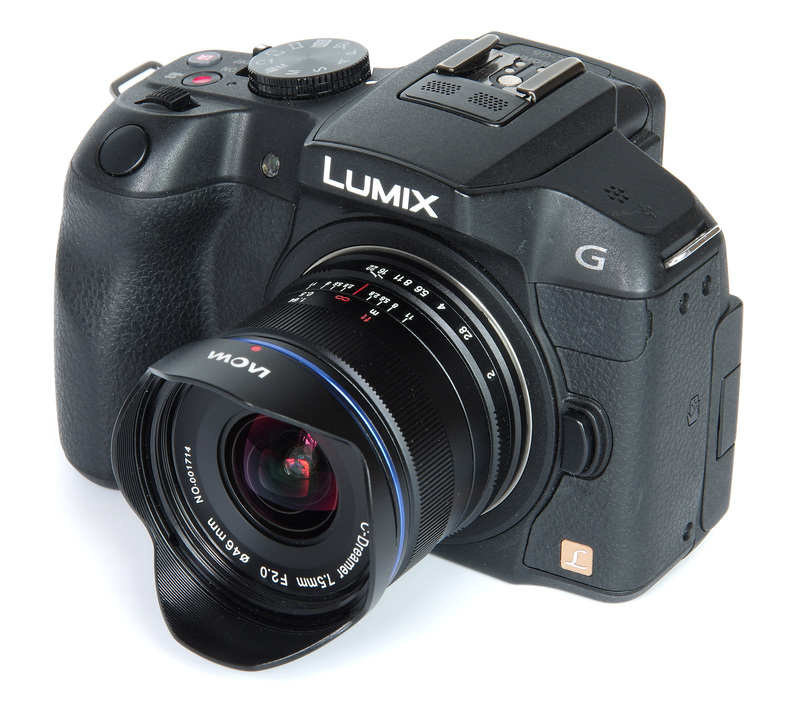 John Riley reviews this new wide-angle prime lens for Micro Four Thirds cameras, with a bright f/2.0 aperture. Laowa have been steadily building an excellent reputation for unusual and high quality lenses. Now we have the brightest ultra-wide angle lens for MFT cameras, with an impressive 110 degree angle of view, equivalent to 15mm on a 35mm format camera. It will be very interesting to see how this lens performs, so let's have a closer look. 7.5mm, or 15mm in 35mm format terms, is definitely ultra-wide. This is approximately as wide as a rectilinear lens will traditionally get, and the first Zeiss, Leica and Pentax 15mm lenses were revelations in their day. However, those first designs were limited to an f/3.5 maximum aperture and this Laowa breaks newer ground with a very bright f/2. Aspheric elements were the key to new designs in the 1970s, very expensive to produce, and now Laowa has a design that includes two double sided aspheric glass elements in its 13 element in 9 groups construction. There are also 3 ED (Extra Low Dispersion) elements. It is remarkable that all this is contained in such a diminutive lens, weighing in at a very modest 163g without hood. There is even a “Lite” version (150g) which is intended for use on drones, definitely a sign of changing times. Taking a tour of the lens, starting at the front element we see a fairly bulbous shape, but a much smaller diameter than we might expect. The filter thread is 46mm and there is a bayonet fit for the small petal lenshood. The lens construction is all metal and made to a very good standard. The fitting of the hood itself though is very tight, nowhere near the slickness of some, but on the other hand, there is no way it is ever going to become accidentally detached. I would keep the hood on at all times as it adds very little bulk to the lens. The manual focusing ring is smooth and firm in action. There is also an effective depth of field scale provided. This is especially useful as focusing a 7.5mm lens on a small format camera is not easy. The quickest technique is to use the scale to set the hyperfocal distance for a given aperture, and then just shoot away without trying to refocus. This works well for landscape, architecture and street photography, the available depth of field being huge. For example, if set to f/5.6 the scale suggests that everything will be in focus from infinity to around 12 inches (30cm). If a higher standard of sharpness is required, then leave that as set but use f/8 instead, thus increasing the amount of depth of field but keeping within the parameters for the wider aperture. However, it is fair to say that some effort with manual focusing can yield interesting results, and the picture of the frog is an example. Very close subjects such as this, which was around 3 inches away from the front element, do need to be focused on. The background will then be very much out of focus, despite the ultra wide angle. Effects can thus be obtained that reveal the quality of the bokeh of the lens. The only other feature on the lens barrel is the aperture ring, and this follows the normal progression of apertures from f/2 through to f/22. The ring is very nicely click stopped, with just the right amount of firmness. Going back for a moment to the subject of frogs, the lens has FEC (Frog Eye Coating) on the front element, this being designed to repel grease and water. Otherwise, we have multi coating on all elements. 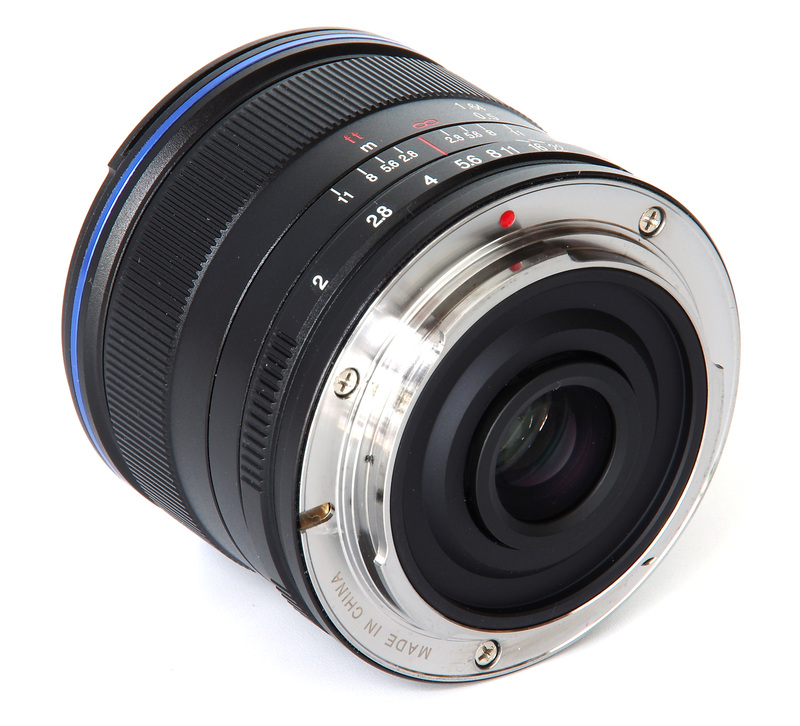 Overall, a unique, well-made lens that is easy to use despite its ultra wide angle. Looking at central sharpness first, we find that this is outstanding from f/2 to f/5.6, excellent from f/8 to f/11, very good at f/16. It is only at f/22 that diffraction really starts to have an effect and reduce sharpness, although it is still good even so. The edges are not quite as cuttingly sharp, but they are sharp enough and are at a very good standard from f/2 all the way through to f/11. Sharpness is still good at f/16 and it is only at f/22 where we can describe the image as soft. For any lens, this is a very creditable performance, for an ultra wide especially so. CA (Chromatic Aberration) is very tightly controlled at the centre of the image. Fringing can be seen at the edges, but it's a pretty good result for this type of lens anyway and can be dealt with using software. For test purposes, any in-camera correction is switched off, although some MFT bodies may have an inbuilt correction that even affects the RAW output. There is -2.87% barrel distortion, again a very reasonable result. This can also be reduced or removed via software, but for many images this may not be necessary. Barrel distortion and ultra-wides tend to be well accepted by our eyes, whereas pincushion with such a lens would definitely look very strange. Flare is generally well controlled but can be induced in more extreme shots, such as where the sun is actually at the edge of the frame. Even here though the actual contrast is well maintained and it is just the artefacts that show that flare exists. This can be made use of in the composition, although technically a fault, aesthetically is can be used to advantage. Bokeh is the quality of the out of focus areas in an image. On the face of it, there are fewer possibilities for differential focus with such a wide lens, but with a bright f/2 maximum aperture and close focusing there are possibilities. The bokeh is very relaxed and well gradated in these circumstances and the difficulties of precise manual focusing are worth the effort. 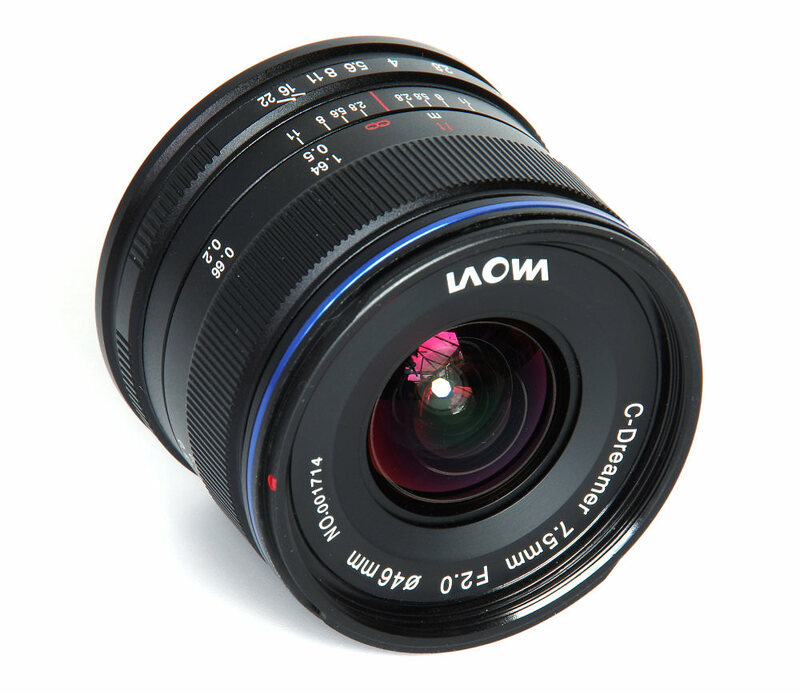 The Laowa C-Dreamer (Compact Dreamer) 7.5mm f/2 lens is available for £499. It is only available in MFT mount. There are several fisheye lenses of a similar focal length, but looking at rectilinear lenses only there is a very limited choice. We have the Olympus M.Zuiko 7-14mm f/2.8 PRO Digital ED (£999), the Panasonic Lumix G Vario 7-14mm f/4 (£739) and the Panasonic 8-18mm f/2.8-4 ASPH Vario (£1049). None of these is as bright as the Laowa lens. 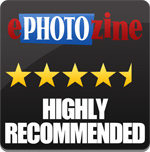 For more options have a look at the Top 33 Best Micro Four Thirds Lenses. If ultra wide angle lenses gel with your style of photography, then this is a great little lens. It's easy to use, gives fantastic results and is light and compact. It is also reasonably priced compared to the alternatives. In addition, it very bright and this is unique at this focal length, which opens up new possibilities for image making. 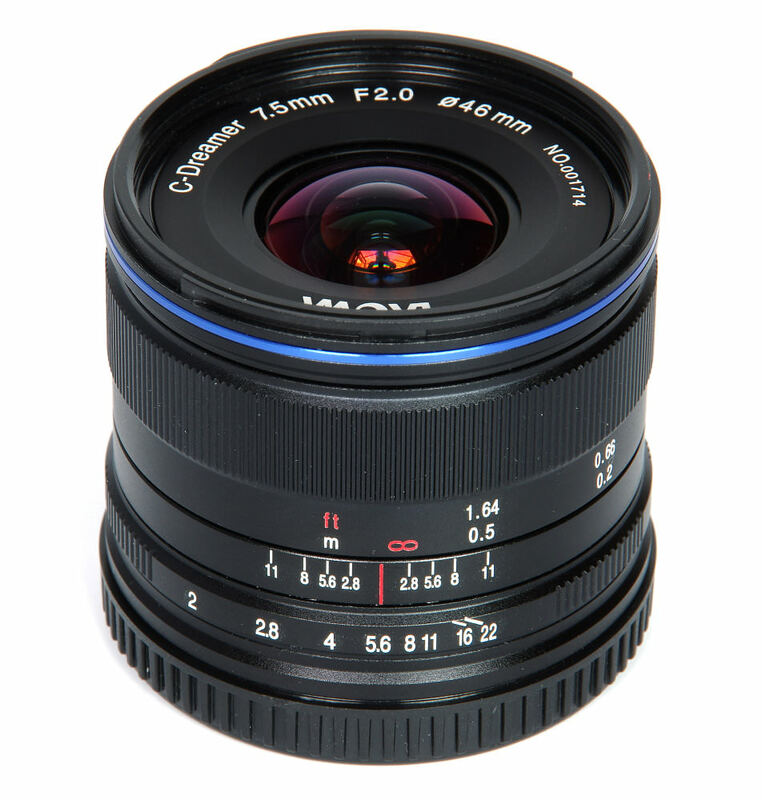 A unique, bright ultra wide lens with excellent performance for MFT users. A remarkably strong entry for mft. I was expecting incredibly poor performance wide open and poor optical performance, but looks like review are going the other way. Another on my to buy list!